When Freddie Ramos opens a package and finds a brand new pair of purple sneakers, it's Zoom! Zoom! Zapato and he's off to race a train. He moves fast with the sneaker's superhero powers. Freddie can't help but wonder where the mysterious sneakers came from. While he tries to solve the mystery, the reader learns he lost his soldier father two years earlier through a carefully woven back story.We also learn of his Latino heritage through easy to understand Spanish words. His new Zapato Power makes Freddie feel like a hero. He uses his superhero status to do good by cleaning bad words, grabbing a library book and saving a dog. The black and white comic book style illustrations by Miguel Benitez are a perfect fit for the superhero theme. The author, Jacqueline Jules, leaves the reader wanting to read the sequel when Freddie finds out the shoes came from an inventor. 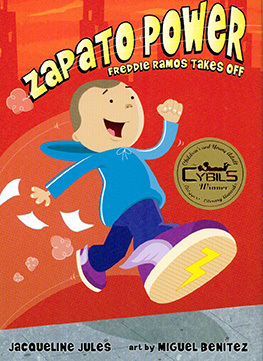 Zapato Power had me laughing out loud. I loved the fresh voice of a Hispanic main character. I highly recommend this early chapter book with fantasy elements for the Hispanic boy, but it is so fun, it will appeal to a wide range of children. (Ages 6-9) Highly recommended.